I wasn’t sure I was going to make it when I went to bed last night without a functioning boss fight, but this morning I got a ton of work done and managed to get it all together at the wire! My only regret is not having a reload loop at the end… you gotta do what you can in the time you’ve got. 7 days of frantic craft… Click the image to check it out! In a marathon session last night, my friend and comrade Mark Shoemaker did me a solid by whipping up some badass audio that I’m working on hooking up in a way that will do it justice. He even got me music for my fledgling title screen. 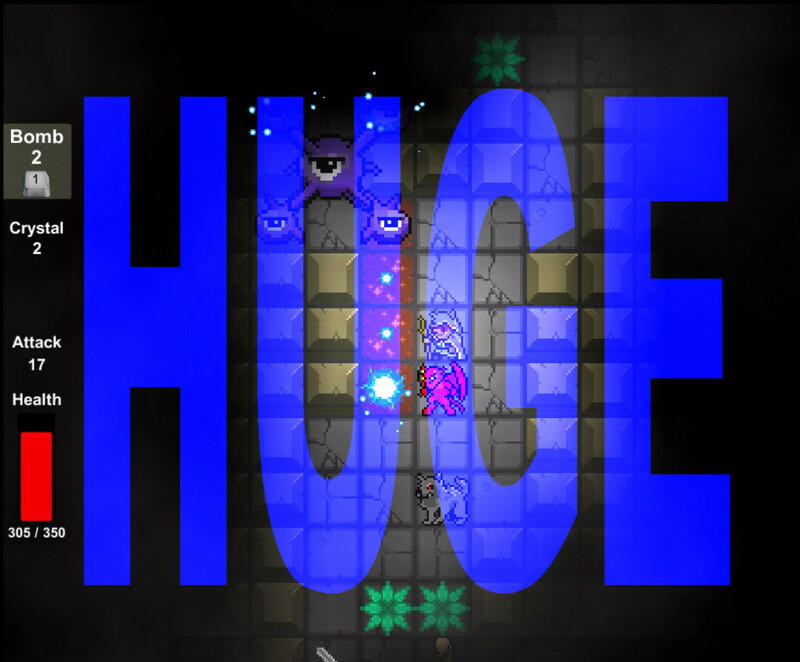 I got the boss wandering around properly, and am finally using sound to build his presence when he is near. Sound hookup is ongoing, but it’s already quite a difference. I also got the maps populating a bit better to boot. The home stretch is here, so I’ve got to do the boss attacks and give the player the ability to turn crystals into bombs… oh, and a win state would be nice. Wish me luck!